Chanteur Rockabilly Français né le 25 Mai 1954 à Charleroi (Belgique). Tony Marlow à débuté en 1976 à la batterie avec Victor Leed, puis en 1978 il fonde les Rockin' Rebels. Il a aussi accompagné Sonny Fisher, Vince Taylor et Freddy "Fingers" Lee. Puis il créé le Tony Marlow's Blue Five et Betty & The Bops. 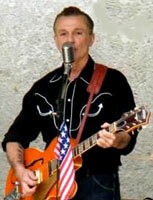 Tony Marlow est l'un des pilliers de la scène Rockabilly Française. Tony Marlow was born on May 25, 1954, at Charleroi, Belgium. He moves with his parents to Corsica, where he starts playing drums at the age of 13. At 15, he earns his life by playing music, in holiday camps and open-air dance parties, -often 6 or 7 hours non-stop. What a formative experience! His first and main influence was Elvis, whom he discovers in 1970 with the LP "Live in Vegas". Then follow Eddie Cochran, Gene Vincent, Chuck Berry and all of the rock and roll pioneers. At 20 years old, he moves to Paris, where his love for rock and roll music drives him to places like the Open Market, the Golf Drouot (on Sunday afternoons) and to the Elvis Treat Me Nice Fan Club. In 1976 he plays drums with Victor Leed and, a few months later, meets Eric "Tintin" Rice at a jam session. Impressed by Eric's voice and stage show, he proposes him to set up a rockabilly band. So, on March 1977 the Rockin' Rebels were born, but the band really started out on November, with the arrivals of Jean-Marc Tomi (lead guitar) and Jean-Paul "Nono" Joannes (bass). On May 1978 they record their first disc on the Skydog label, under the guidance of Marc Zermati (Western/Ravin' Sound). 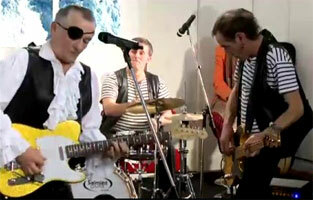 The band makes an impressive string of gigs (Swing Hall, Gibus, Palace, plus some rock festivals) followed by several rave reviews in rock magazines, that state them as leaders of the budding French rockabilly scene. As a drummer, Tony's main influences are Dickie "Be Bop" Harell, DJ Fontana, Sandy Nelson and Bobby Clark. When Eric Rice leaves the band on December 78, Tony starts singing while playing drums. His old buddy Ramon Rocces Jr. joins up the band on piano and sax. In 1979 and 80, their first album comes out (CBS/Skydog), they make their first TV appearence (Chorus/Antoine de Caunes, with Vince Taylor) and they play at the Olympia theater before recording their second album: Frogabilly, produced by Marc Zermati (Underdog/Carrère). In 1981 Jean-Jacques Bonnet joins the band on drums, and Tony becomes the lead singer. In April, the Rebels are the support band for the first Stray Cats French tour (10 dates). In 1984 they share the bill with Mac Curtis, Jacky Lee Cochran, Mink de Ville; record their third LP: 1,2,3...Jump! (Underdog/Carrère) and a lot of singles. The same year, they meet Aldo Martinez (ex Chaussettes Noires) who produces "Branche le Poste", a semi hit with a strong radio airplay (RTL, NRJ, Europe 1) and a lot of TV appearences. Tony continues to play drums with Sonny Fisher, Vince Taylor and Freddy "Fingers" Lee. In 1985 the Rebels stop, and Tony sings under his own name in the Parisian clubs. In 1987 he launch a new band: "Tony Marlow et les Privés" with Jean-Marc Tomi, the first French jump band with a horn section, who plays covers of Louis Jordan and Louis Prima, -Jump, Jive and Wail 10 years before Brian Setzer! (CD "Flagrant délit au Slow Club.") In 1988 he set up "Rock Frénésie", a string of rock and roll nights, that last until 1994 (Chapelle des Lombards/Slow Club). Involved as a music promoter too (organisation, DJ, sound) Tony deals with the top of the rockabilly and jump band from all over the world (Planet Rockers, High Noon, Big Sandy, Wildfire Willie, Red Hot and Blue, Royal Crown Revue...) as well as with the French bands (Rock Frénésie compilation). At the same time he creates Tony Marlow's Blue Five (1988), and then Betty and the Bops (1991). The Blue Five play all over the Europe (Bonn, Venice, Amsterdam) and make an impressive single (Melle voulez-vous?) Tony starts studying guitar and works on the licks of the 50's masters (Scotty Moore, Cliff Gallup, James Burton, Grady Martin...) Betty and the Bops, his other band, play at the Hemsby festival (UK), as well as in the whole Europe (Barcelona, Geneva, Holland and Germany.) They share the bill with Billy Lee Riley, Sleppy Labeef, Don and Dewey, Big Al Downing, the Comets, Scotty Moore, DJ Fontana and the king of rockabilly himself, Mr Carl Perkins (Elysées Montmartre, March 3, 1996). Betty and the Bops have made out 5 albums. In 1995, Tony's own instrumental "Hot Rod Special" becomes a massive hit in the English rock and roll circle (Crazy Gator EP). Always on the move, he brings the Rockin' Rebels back together (CD's: World Rockin/2001, Elvis Calling/2005), launch the band "Bandit Mancho" (CD: 2002) and makes a huge success at the Rhythm Riot festival (UK) and at the Summer Jamboree (Italy). In August 2004, he makes a "pilgrimage" to Memphis, on the King's tracks (Sun studios, Graceland, Tupelo). In October 2005 takes place one of the highlights in Tony's musical life: Betty and the Bops backed the queen of rockabilly herself, Janis Martin, for a one night spot in Concarneau. In 2006, he starts with a new band, "Guitar Party", where he plays all the instruments on his own in the studio (except double bass by Franck Abed), synthesizing in this way 30 years of rock and roll music (drums, bass, guitars, Vocalss.) On stage he performs with a rhythm section (double bass, drums) as on September 7/8, 2006, when he plays as the support band for James Burton and TCB Band. Completely alloted to the rock and roll cause, he contributes to several magazines (Southern and Rockin', Rock and Roll Revue, Elvis My Happiness) and keeps on entertaining people all over France and Europe with his "Guitar Party"! 09/2016 SP FREN 102 (F) Tony MARLOW TRIO - Rock And Roll Princess / Spank! CD : The Booze Fighters / Rock And Roll Guitar / The Missing Link / Hot Rockin’ Mama / Cliff And Dickie / All Aboard / Lonesome Rider / Chippenham Blues / Foolish Girl / Uncle Berry / In Search Of Drums City / Be Boppin’ Daddy / Stratojet / Big Sandy / El’s Angels / Good Days Are Gone.